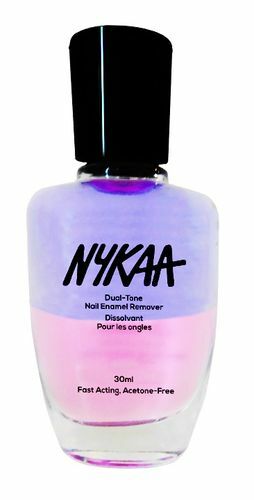 Say goodbye to stubborn nail enamels with the Nykaa Dual-tone Nail Enamel Remover. Its two phases are colored different, making it one-of-a-kind nail product. A single swipe of this acetone-free remover gets off all the nail enamel, leaving your nails residue-free, protected, and moisturized. The formulation does not dry the skin nor the surface of the nails. It is composed of a water phase enriched with moisturizing substances. Leaves your nails squeaky clean and hydrated. Explore the entire range of Nail Polish Remover available on Nykaa. Shop more Nykaa Cosmetics products here.You can browse through the complete world of Nykaa Cosmetics Nail Polish Remover .